Featuring straight sides, a casket is an alternative to the traditional coffin shape. All Wooden Caskets come with the genuine Colourful Coffins® daisy stud on the foot end. 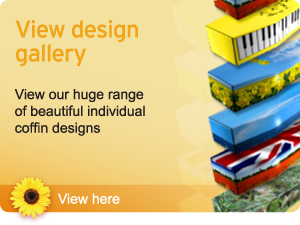 "As individual as you" is our motto, and we believe that everyone should have the opportunity to choose one of our stunning Colourful Coffins® designs in sizes to fit all; The Big and Beautiful range of wooden picture caskets provides the perfect backdrop for our range of designs. All Big and Beautiful coffins come with the genuine Colourful Coffins® shoulder decorations.